Grameen America: The Partnership Fund provided financing to Grameen to support the expansion of its micro-lending operations in New York. To date, over $448 million in 178,000+ loans has been disbursed in New York – helping to lift more than 48,000 women out of poverty. Hot Bread Kitchen: This Harlem-based nonprofit prepares immigrant and low income women for jobs in the culinary industry, funding those operations through a revenue-generating bakery that sells ethnic breads inspired by its bakers. Founder Jessamyn Rodriquez has been honored with Clinton Global Initiative’s “Global Citizen Award” and former Mayor Bloomberg’s “American Dreamer Award.” The Partnership Fund financed equipment purchases and provided Hot Bread with working capital. The Doe Fund: Their 400-bed transitional residence in East Williamsburg, Brooklyn – which the Partnership Fund helped to finance – is providing counseling and education to help homeless adults secure jobs and independent housing. Greenpoint Manufacturing & Design Center: Headquartered in Brooklyn, GMDC is a non-profit real estate development company that creates and preserves affordable manufacturing space in NYC. The Fund has made three separate loans to GMDC, which enabled GMDC to develop properties in Greenpoint, Crown Heights and East Williamsburg, Brooklyn. GMDC currently owns and manages five properties, which together represent more than 700,000 square feet of space. These buildings are occupied by more than 110 businesses that employ over 600 people. Tenants include woodworkers, makers of home furnishings, food manufacturers, garment companies, metal workers, and a variety of artisanal trades, artists and designers. FinTech Innovation Lab alumni companies have raised over $515 million in follow on funding and have created nearly 500 jobs. Creditex: The Partnership Fund’s extensive support for the NYC fintech sector included a direct investment in Creditex, an electronic trading platform for credit derivatives. The company was acquired by Intercontinental Exchange (ICE) in 2008 for over $500 million. ICE owns and operates a global electronic marketplace for trading in futures and over-the-counter commodities. At the time of its acquisition, Creditex had 150 employees in New York. SchoolNet: The Partnership Fund was an early supporter of the NYC ed tech sector with our investment in SchoolNet, a company whose enterprise solutions software for K-12 enable schools to collect, integrate and analyze key data to boost academic outcomes. In 2011, Pearson, the multinational education publishing company, acquired SchoolNet for $230 million. At closing, SchoolNet employed 65 people in NY. New York Digital Health Innovation Lab alumni companies have raised over $250 million in follow on funding to date. Intracellular Therapies: Investing to catalyze growth in the life sciences sector in New York City, the Partnership Fund provided capital to this early stage company which is developing vital, new drugs to treat diseases of the central nervous system (including Alzheimer’s, Parkinson’s, schizophrenia and depression). An initial public offering in February 2014 raised over $100 million for the company. 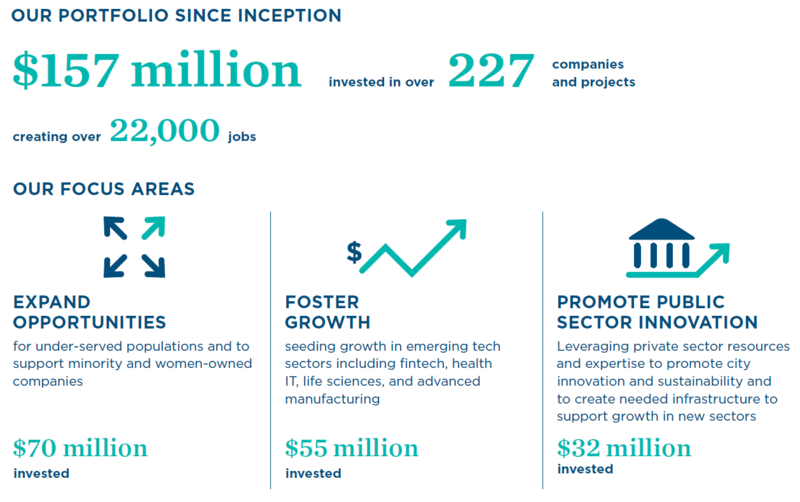 Since going public, ITCI raised an additional $345mm of equity in September 2015. The Partnership Fund has committed $40 million to catalyze the life sciences sector and spur commercialization of research emerging from NYC’s world class academic institutions. New York Genome Center: Established with a mission to transform biomedical research and clinical care, the NY Genome Center — opened in 2013 — enables an unprecedented collaboration of technology, science and medicine to power innovation and discovery to save and improve people’s lives. Public, nonprofit and private supporters — including the Partnership Fund — have joined together to provide more than $100 million in funding for this vital center for genomic research and medicine. institutions. NYC Bike Share: NYC Bike Share is a privately-owned public bicyle sharing system that serves NYC. The Partnership Fund’s investment funded expansion to high-need communities in Harlem, Bedford-Stuyvesant and Crown Heights, among others.